If you’re giving a presentation and want the audience to hang on your every word here’s a tip: Announce you’ll give away free stuff to people who answer questions correctly during your talk. Trust me, it works like a charm. I saw it in action during Peter Shankman’s keynote address at the Global Creative Economy Convergence Summit 2009 sponsored by Innovation Philadelphia. Shankman is the founder of Help A Reporter Out, a.k.a. HARO, a free service that connects reporters to sources for articles. He gave a breakfast talk, and though the caffeine had barely kicked in, Shankman held the crowd in rapt attention, because from time to time he’d ask a question and then toss out a small box to whomever gave the correct response. No one knew what the heck the freebie was, but no matter. Shankman deemed it a “cool new toy” — ‘nuff said. At the conclusion Shankman revealed the cool toy was a Poken — which like David Hasselhoff, is huge in Europe. This small USB-enabled device lets you transfer your contact information, including social network info, to someone else’s Poken, and vice versa. 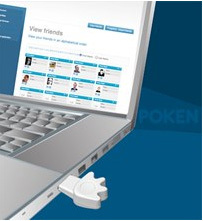 It’s an electronic social business card that plugs into your computer to download the information collected. Shankman predicted the Poken would soon be a big deal in the States, too. Time will tell on that score, but the point is, the chance to win a nifty mystery thingamabob kept all ears riveted on the speaker. This is not to suggest that he’d have otherwise lost the audience; Shankman is an entertaining guy and worth hearing in any event. I’m just saying the freebie factor made the desire to listen all the more intense. Also, by asking questions there was audience interaction — another good way to reel folks in. As for the content of his address, “Social Media, It’s Simply Trust,” Shankman declared that to succeed in selling through social media you must not only build a better mousetrap, but build one that’s hard to copy. Because things get passed around fast and imitators abound. He then revealed the four rules he employed to build HARO into a successful service (it has in excess of 100,000 members). A fundamental rule of social media is to be who you say you are — don’t be a poser. Shankman says don’t lie about anything. If you mess up, admit it, accept the blame and make it right. Beyond saying or passing on something of value you need to know how your audience wants to get information. Web site, mobile device, video, podcast, blog, press release, email — however your audience wants to receive information, you need to serve it up. Along with being the soul of wit, brevity is essential in a society where simple text messages, microblogging and short attention spans rule. Keep it concise and relevant and be sure there are no spelling and/or grammatical errors. Keep in touch with the people in your network just to say, “Hey, what’s up?” Or, do something like Shankman does, which is to send out birthday wishes to everyone in his Facebook network. What do YOU think of Shankman’s ploy to keep everyone interested? What about his four rules for business success through social media? Comments welcome. Who And What Drives Innovation And Creativity? I thought his presentation was disappointing, entertaining yes, but seemingly aloof from the Creative Economy. His gesture of offering free stuff to responders, and hawking a product he admires, diluted his talk. Also, the note about brevity, it’s good for sales but persistently bad for innovation. Contrition cuts away meat with the fat, seeking brevity will get you a headline, but the real change comes with the narrative and a dialogue that is expansive, and not truncated to fit sound-bites. “Short-attention span” is a myth, a device, a belief, to keep sales messages flowing, it’s disconnected from innovation and can stunt it. The opposite is needed if we want to build a new economy. I’ve been working on my own thoughts for a few days now. I admire what the summit intended, and there were some gems for sure, but it displayed a disconnect between those who seek to build and a support a new economy, to put positive growth forward, and those who wanted to sell services. I will try to complete it over the weekend. I hear you on the need for dialogue to formulate and advance innovation. It often takes deep thought along with a desire to look at and evaluate things from many angles to make real breakthroughs. But then inspiration can also come at a moment’s notice and there have been great discoveries/products/services that came about almost out of serendipity and basic observation (Archimedes taking a bath and then seeing how this can determine the volume of an object, for instance). As for the short attention span issue, being a writer who loves words, ideas, and yes, spirited discourse, I too would prefer that others could be of the same mind. However, I have found, just as Shankman pointed out, that my smartphone pals are prone to communicating though brief messages of few words. There is an entire text message syntax based on just letters. Not saying I’m into it, but this a reality. If that’s your audience, you need to meet them on their terms. My comments on Shankman were within the arena of “Creative Economy,” as this was the gist of the conference. I agree with you generally, but specifically to this topic and as part of a conference geared towards investigating and developing this topic, I felt the message missed the opportunity. As to short-attention-span, you’re right, it matters by who your audience is. Yes, we do use brief messages, but you (as I do) also post to our blogs. Do we not want people to read our blogs, and not to learn of our abilities via text messages alone? Plus, it could be the next wave is not about online content. It could be that short messages arrange people in networks, but that the meaningful relationships, and the sharing of content (stories, ideas, etc.) could be taking place face-to-face (as in co-working spaces), and more locally than before. Terms? Terms are created by culture, the Creatives lead that culture. It starts out on the fringe and moves towards pop-culture. We are the leaders, not the end-target. We don’t need another gadget, we need forward-thinking innovators who want to help build a new economy, one derived from the amazing possibilities provided by the Creative Economy. PS. This post today by Simon Dumenco on AdAge hits the brief-messages nail on the head. Yes, I do blog. I am also an arts writer/reviewer of longstanding and was for many years a professional journalist. So long-form content, I’m all for it. But I also like Twitter. I have been turned on to people and all kinds of information that I would otherwise know nothing about. Twitter has helped attract readers to my blog — this may be how you found it (don’t know). I could, however, have a devil’s advocate conversation with myself over Dumenco’s AdAge piece. I too dislike the proliferation of minor snippets that proliferate through social media. It seems like many a blogger/lifestreamer posts just about any thought that pops into his/her mind, often making it seem like a profoundity, when it’s just a casual observation that most anyone could make. Or else they’re grabbing an image/graphic and putting it up with one or two sentences to represent their deep thoughts on it, when really all they’re doing is stuffing in content to help with search engine optimization. Others are just prone sharing way too much. But then I don’t necessarily think that social media causes that to happen. It just better enables and amplifies how it can happen. What’s the future or terms of it all? I don’t know except that convergence is accelerating, privacy is long gone, we are in a second industrial age (this one’s digital) and creatives can still lead the culture, though they may be wearing an iPod while doing so.